Belfort was 4 years in the making from initial seed in our brains to final product on game tables everywhere. In our interview series, “Belfort: From Inspiration to Publication”, we bring you the perspective of the whole process from start to finish from the perspective of the people involved in making the game a reality. Next up, we’re sitting down with Belfort’s developer and fellow game designer, Seth Jaffee (Terra Prime, Brain Freeze, Eminent Domain). Sen: Welcome, Seth! Good to talk with you again. Tell us – what motivated you and Michael to sign Belfort initially? Seth: We played it at GAMA and I was really happy with the overall feel of the game. It really fired on a lot of different cylinders for me, much like Homesteaders did when I first played that. Jay: Which, coincidentally was how we met. You were playtesting an almost finished prototype of Homesteaders and I asked if I could play – not knowing you were part of the publisher team! But enough about you – more about Belfort! Seth: Well, I thought it could use some polishing but I saw a lot of potential there. It was clear to me, in talking to Jay, that a lot of thought had gone into the game. At the time, Michael and I didn’t have a long list of great games to publish, so we thought this would be a good one to add to the list! Jay: Thanks for making that choice – we appreciate it! For other designers out there, what are some things that designers can do that make their games appeal to a publisher? Seth: I’m not sure I have a good answer to that except to say something generic like, “make it awesome!” I know that I like and appreciate thorough games that are well thought out. It’s also got to have some kind of “hook” – many games are solid structurally, but have nothing to really capture attention, they come across as just mediocre to me. Jay: I remember you and Michael talking to me at GAMA after playing it for a second time. Michael mentioned that he would like a shot at publishing it, but wanted some time to develop it further. That’s where you come in as you’re Belfort’s developer. What’s the role of a developer on the team? Seth: My role is to find games with that spark, that potential, and then make sure that potential is realized. Basically, I get to say, “I think this game would be better if…” and then I get to see if I was right! My goal is for the game to feel to me like a real, finished game that I would want to play again and again. Sen: Is there a timeline for that goal? Seth: The best answer to that is “yes, and no.” I would like to have more time to concentrate on the games so that they can get finished up and published faster, but having a full-time job puts a bit of a damper on that. Also, it’s tough to find willing playtesters as often as I’d like. So it’s very difficult to stick to any particular timeline! I’m trying to improve that though. Seth playtested so much that instead of waiting for us to redo components or art for our prototype, he would just mock up the components he had with Post-it notes and such! Jay: What’s the process of developing a game that you didn’t design? Seth: The process is basically an iterative playtest: consider changes, tweak, playtest some more, repeat. Considering changes includes listening to players’ comments as well as my own ideas, so it’s important to pay attention during playtests. Jay: It’s been very interesting as designers to work with a developer (i.e. you!) on a game we designed. As designers we’re very happy with the game and have had it playtested numerous times to get it to the place where Tasty Minstrel was interested. But then to have you develop and tweak it even further has been really interesting as you definitely added to the overall balance of the game. What were some of the things that you knew you wanted to tweak immediately? Stuff like that. Mostly details, but some significant structural changes. In all cases, my proposed changes were in an effort to accomplish what I thought the game was already trying to achieve- I was not out to change the game per se – just to find a better way! Sen: We think you did an admirable job! Out of all the changes made, what do you feel is the biggest improvements that you and your playtesters made to Belfort? One modification Seth made to Belfort was to reduce the game's length to 7 rounds to make it a faster game. Seth: I think the biggest improvement was probably changing the game length – jumpstarting the early game and reducing the total number of rounds so that players have turns to get things done, but the game ends in a reasonable amount of time on the clock. Jay: A fine balance, indeed! And speaking of balance, how do you balance your vision of what a game could be with the designers’ original intentions? As a designer yourself, is it hard developing other people’s designs? Seth: I actually think it’s easier to develop someone else’s idea than to design and develop my own game from the start. When picking up another designer’s idea, they’ve already done a lot of work so I can pick and choose the parts of theirs that I think are working and I can try to fix the parts I think need work. Jay: Were there any areas that were “off-limits”? I don’t’ specifically remember any really! But do you have to get approval for any changes by the designers or the publisher? Seth: I think that once they sign a game, a publisher can pretty much do what they want, and I have heard stories of themes and rules being changed without the designer’s knowledge or approval. I’ve also heard that some designers, such as Reiner Knizia, put stipulations in their contracts requiring that they must approve all significant changes to rules. I personally like to keep the designers in the loop, so when I think of a change to the game, I usually run it by the designer – it might be something they’ve already tried, and I am not out to reinvent the wheel. It’s also helpful because the designer can playtest changes with a different pair of eyes and different players, making for more testing of any proposed change. With Belfort, I didn’t consider anything “off limits”, but I did discuss each change with you guys. Sen: That’s right – I remember. We were always excited to see on the forum that you had another playtest and had a few new ideas or tweaks to suggest. Jay: I too remember having great debates – in a totally friendly way – about the merits of certain game mechanics. In the end, more playtesting always answered our questions. Sen: Early on there was a chance Belfort could be more serious with humans as all the workers instead of elves and dwarves. Were there any other thoughts of changing the theme of Belfort? Seth: I don’t think I ever considered changing the theme of the game, I liked it the way it was. I also secretly thought to myself that the light fantasy setting of the game might be the land where the TMG logo dragon lives! Jay: And astute observers of the final game board can see that you are correct! Thanks for your time and effort, Seth! Belfort wouldn’t be the same without you! In our next installment, we will be talking to the game’s artist – the prolific Josh Cappell (game designer of Wasabi, artist: too many to mention here). If you are interested in learning more about how we came up with the ideas and how the game grew from something small into what it is now you can read this interview by Jeff Temple and watch this video we recorded. 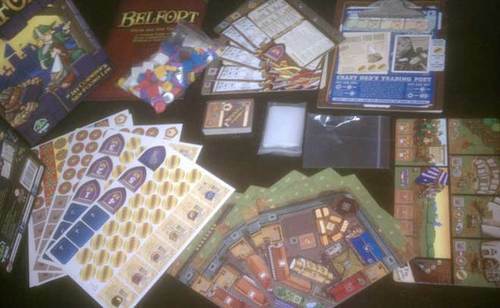 Doug Wooley did a nice un-boxing of Belfort, reviewing not the game play at all, but the actual components. I’m happy to read that the cards are indeed good quality – as is everything else! Some nice new pictures of the bits are included as well. Great job Doug! Read it here. In other news, Sen and I were interviewed on the Global Voices radio program in the Netherlands! Crazy! On the same day we also got word that a publisher in the Netherlands received a prototype that they requested to see – but is not related to why we were interviewed on the radio. It was a very Nertherlandy day! Check it out here (we were on very late into the show). Thanks to Lars for the interview – it was great to chat about our games and our process. Typically, we would wax poetic on how we came up with the idea for Belfort and slaved and slaved over it – lacking sleep, sustenance and hygiene – until it became the game it is today. At least, that’s what we think a Designer Diary usually is. Instead, we thought we’d flip the script a bit and also give you an “insider’s view “of how Belfort came to its final form from the perspectives of the Playtesters, the Developer, the Artist, and the Manufacturers. We’ll be releasing each part over the next couple of weeks, so keep checking back. By the end, you should have a pretty good sense on how a game like Belfort gets out of our heads and into your hands. But before we tell you that story, we have to tell you this story. Belfort comes from very humble beginnings. Very humble. 24 tiles humble. OK – another idea – which is an amalgam a couple other ideas. Take that idea about building castles with orcs and elves…add in the paperclip idea and whammo – you have a weird idea that might not make a great game! Well – I’m still mashing it around in me noggin…so it might turn out to be an actual full-fledged game…but the intention is to make another pocket game. each player has a card for each type of resource (not sure how many). On those cards there is a chart or grid of numbers from 1-5 or so. So the idea with this is – when you accumulate more resources – you slide your paperclip to the appropriate number. So each person would have 3-5 of these resource cards. each person would have a card for each type of worker – with a grid of numbers along it as well. It rambled on quite a bit, but then two days later, we posted this, which looks a lot more familiar (though orcs were replaced by dwarves eventually!). 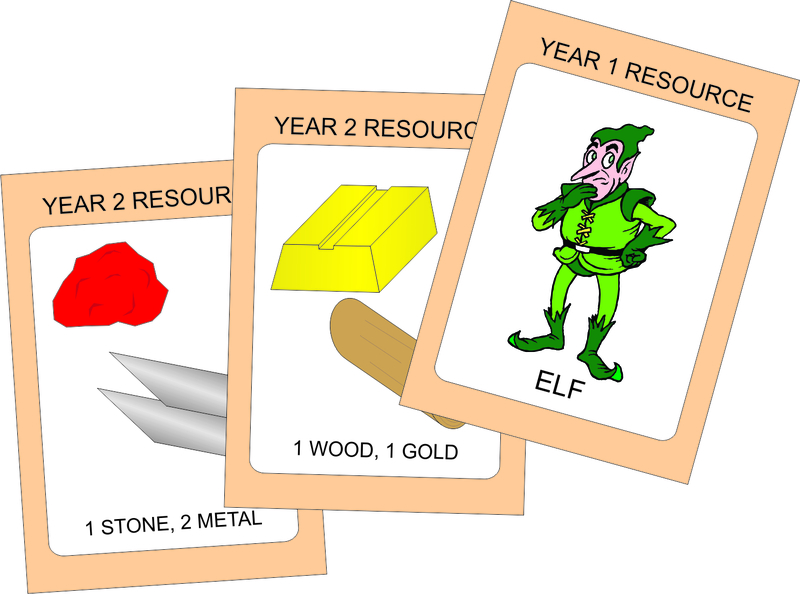 Each player (2 players only currently), takes their 3 resource cards – which now also has spots for their elves and orcs. The idea would be – if you collect resources or creatures – then you’d put a paper clip on the card indicating how many you had. Once we played this 24 tiled pocket game, we immediately knew it had to be a bigger game. We started scribbling down some ideas. Right from the start, we knew it was going to be a pentagon shaped castle! Why? We don’t know! We just found it captured our imagination. Early notes show that there were a lot of ideas from the very beginning that made it to the final product. Once we moved away from the 24 tile version of the game, it immediately became a pentagon board. Even within the first inklings of the concept, there were a lot of solid ideas that survived in some shape or form to the final game. Not all ideas made the final cut, though (thankfully! ), and we have our playtesters to thank for that, primarily. We thought you might be interested to “listen in” on some of our recent discussions with a few of our Playtesters: Marc Casas-Cordero, Xavier Cousin and Michael Emond. Sen: Thanks guys for taking the time to reminisce about Belfort’s humble beginnings from waaaaaaay back in 2007. Jay: So, what are your earliest memories of Belfort? 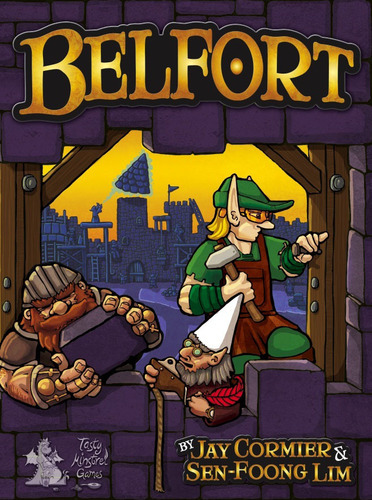 Marc: As an early playtester, I remember the five wedges forming a pentagon to describe the city of Belfort from the get go. I am glad to see the concept has survived through all the development iterations. The use of dwarves and elves as resource gatherers was also there but at the time that is all they did. There was no management of these guys – just have them produce!!!! The main game play was much more about positioning in the city and that seemed to be the primary place for tactical choices. It still remains an important aspect of the game, but it seems better balanced now by the resource management and other aspects of the game. Michael: I don’t know if all of my memories can be trusted but I also vaguely recall that there was a dragon that could be summoned and destroy some of your buildings. I remember it as less focused than the current version but all the key elements were there, waiting to be highlighted and tweaked so they were more playable. Jay: Yes – the dragon! We used to have a dragon in the game but ended up removing it. And because we no longer had a dragon, we no longer needed warriors. Here’s an image of one of early player aids. You can see that you had to make Warriors! 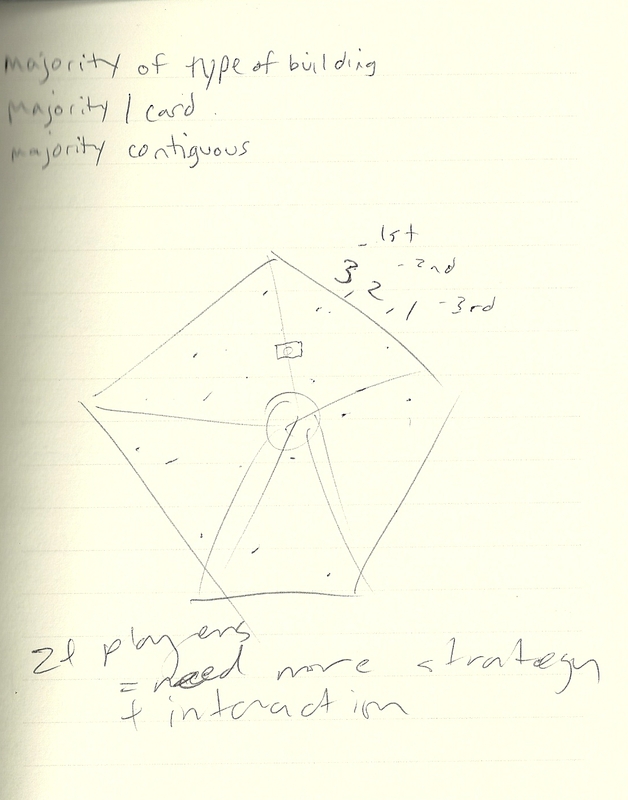 And next is a photo of an early playtest. In that one we got rid of the dragon and added an approaching Orc Horde! They’re both gone now. An early player aid shows many differences from the final game: Gold was a resource and not currency; Buildings had abilities but there were no Gnomes; Warriors existed to battle the dragon or approaching Orc Hordes! Sen: Are you happy or sad that they’re gone? Michael: So very happy they’re gone! 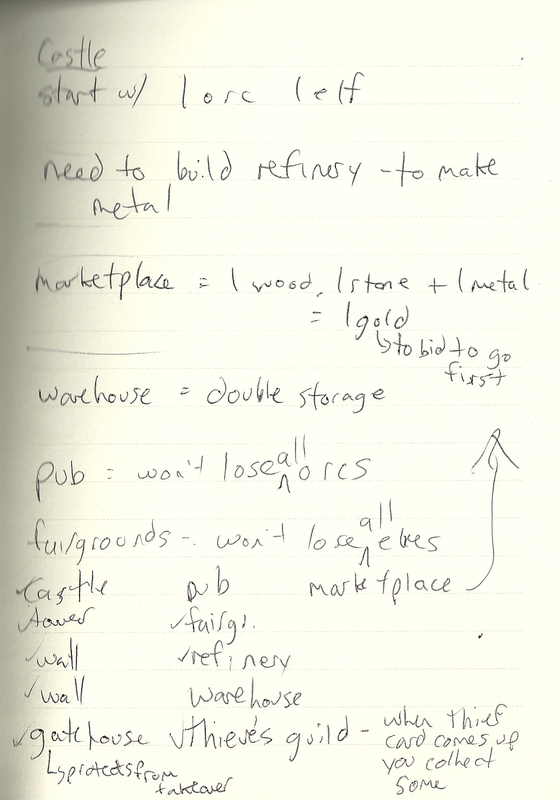 I think the key story element to this game is getting resources and building structures. Things like the dragons and the warriors felt forced into that story and the dragon, especially, was not a fun game element. You think everything is going okay and you’ve played well … BOOM here is the dragon to mess up everything!! Here's a picture of a playtest session. You can see in the top right we had an Orc Horde track. Xavier: The idea was fun but I remember playing with the dragon and it didn’t really work. It was too many things I think to handle and plan ahead so I bid it adieu with no regrets. Marc: I can’t really remember them so they must have been nuisances. Sen: That’s what playtesters are for! Jay: Exactly! Which elements in the final game do you think you had some impact on based on your playtests and feedback? What would be your “claim to fame” regarding Belfort? Michael: My feedback was along the lines of, “Too complicated -Streamline the game more!” and I think that’s what has happened. In a sense, the current game has just as many elements as before but they fit together more logically instead of feeling like they were tacked on like a Lego house. Before there also seemed to be a lot more ways to score points that made it a headache to keep track of all the things you needed to be doing. I noted that it was hard to determine what you should be doing as a player to maximize your score – it was only in hindsight you could figure this out. While I am not sure how much this has really changed, it definitely feels less complicated in its current version. Marc: I would like to think I said, “Wow guys, the board looks fantastic! Do not change a thing!” but I can’t honestly say how I contributed to the game except that I suffered through the early iterations! It’s like sitting through the unburned early musicals of Stephen Sondheim. Except that musicals are shorter. Sen: Ha! We’re the first to admit that the first few iterations of any game can be challenging. That’s we’re so grateful for having playtesters like you guys! Jay: We couldn’t do it without you! 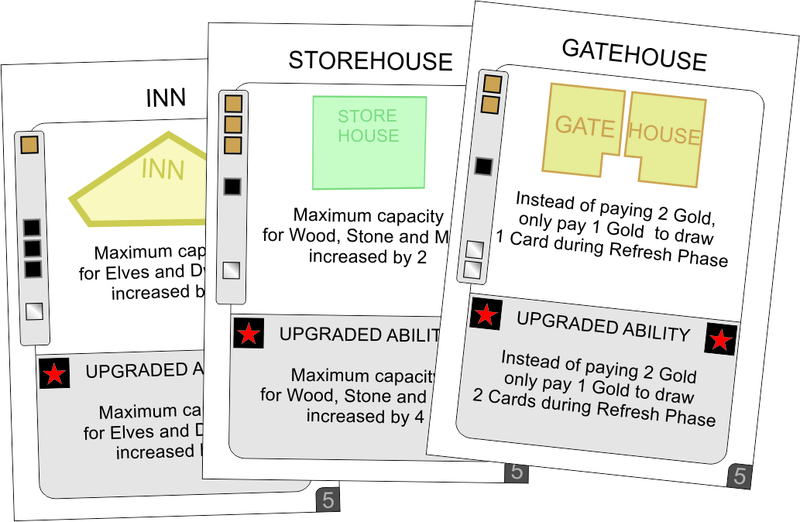 Here are the first attempts at giving each building its own card. Still no Gnomes - but the concept of unlocking an ability was there. Sen: In some of the original versions, you could build any building you wanted anywhere on the board without needing a specific card in your hand – what are your thoughts on what’s improved or what’s missing since that decision? Marc: I think the move to building cards is a smart one. It definitely improves the early game as players are not overwhelmed by the choices of the entire city. Furthermore, without building restrictions it was easier to hang on to leads in area majority thus reducing the overall suspense of the game. The choice of building what you what is also limited by your resources and that is a more interesting game decision. Xavier: Yeah, there was way too much thinking and less fun since you always had the possibility to go anywhere you wanted. It helps focus me on what I can be doing. Yes, it restricts your decisions but that also has the benefit of focusing your decisions and simplifying the number of things you can do at any one time. It adds some luck without it making the game too luck-based. So it adds a nice element of chance that can spice up any game and creates more variability from game to game. Jay: Previous incarnations of the game had gold in it, but it was just another resource used to make buildings. Alex Cann, one of our other playtesters who couldn’t be reached for this interview, brought up the fact that a common currency was needed to streamline decisions. How has the addition of gold as currency changed the economy of Belfort? 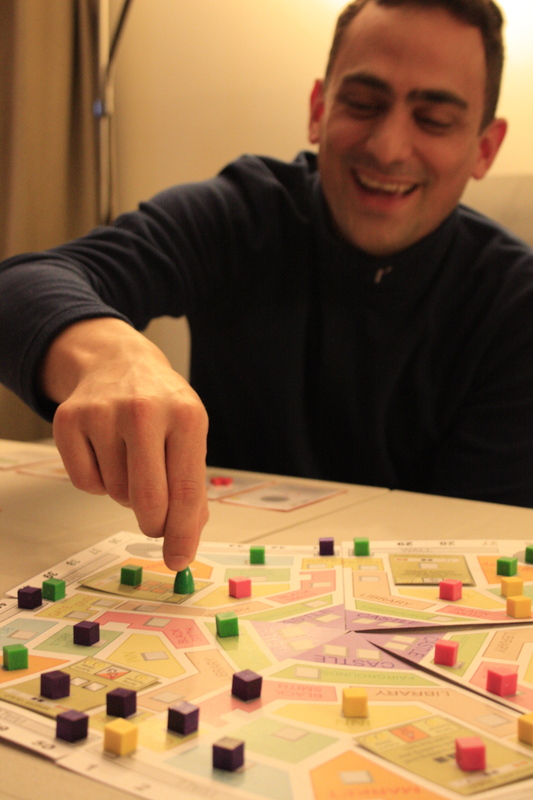 Here's Xavier enjoying the heck out of playtesting Belfort! Xavier: Gold is good to have since, without it, the game was a little “naked” in possible things to do. There’s only so much you can do with just the wood, stone and metal, so having a treasury to buy stuff makes it a little richer without making things too complicated. Michael: It works because you can channel some of the different ways to get points into one common point system (gold) and allows for the addition of taxation. Overall, I think that was a smart move since it helps me, as a player, to be able to understand how one move (building a new building) relates to another move (getting more resources) in terms of overall scoring. 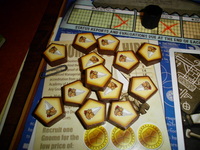 Jay: Oh yeah, the concept of taxation came from another playtester, Matt Musselman. He thought it would be a great idea to help those in the back make a bit of a comeback. And it was a great idea! Sen: Well, thanks so much, guys, for sharing your early experiences of the game with us. Jay: And thanks again for all your playtesting efforts! They certainly helped make Belfort the game it is today. 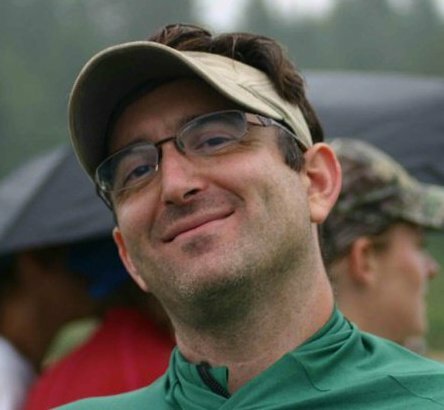 Up next we’ll chat with the Developer, Seth Jafee. “What does a developer do,” you ask? Find out in our next post, fearless reader! A few new reviews have popped up about Belfort and Train of Thought. It’s very exciting to read about people continuing to discover Train of Thought and I think Josh got exactly what we were going for with the game. The Belfort reviews are also exciting as this is our first big Euro game. I’m overjoyed that those that got copies at GenCon are enjoying it so far! Oh – as an update on when non-GenCon attendees can get their hands on Belfort, we’ve been told that it was finally put on a boat this past Wednesday and should hit America around September 26th. That means it will still take a couple of weeks for it to make it through the system and get to retailers so expect it some time in October. Too bad about the delay, but we’re in the home stretch now! We’ve discussed the money side of negotiating a board game contract, but there is more than just money that has to be negotiated. Let’s take a closer look at how to negotiate the rights to your game. Game Changes: Ensure that the contract specifies who has final say over any changes made with your game. If it’s the publisher then ensure you have a exit clause that allows you to cancel the contract if they have changed your game so much that you don’t want your name on it anymore. If you’re a new designer then you probably won’t be able to negotiate this, but at least ask about how much input you’ll be allowed to give on any changes. Most of the time the publishers will keep you in the loop on any changes and often even ask for your thoughts or feedback on them. Return of Rights: You’re going to need to ensure that there is a clause in the contract about how you can get the rights back to your game. When you sign the contract you’re signing over the rights to the game which means you don’t own it any more. A common practice is that if there are no more print runs after a 2-3 year period of time, then you get the rights back. This means you can pitch it to another company. While that might seem silly because that means it wasn’t selling that well, there are many cases of games that just didn’t have the right marketing to raise awareness and have failed, only to be picked up by another publisher and succeed. Every year there are many examples of games that are reprints of games that have previously been published. One designer stipulated on his contract that if his annual revenue from this game falls below $X then he regains the rights to the game. This is interesting as it encourages the publisher to advertise the game and work a bit harder to ensure it’s bringing in the required revenue. Foreign rights: Do you want the publisher to have worldwide rights to your game? That depends. Have they distributed games to the rest of the world before? If not, then maybe it’s best if you kept those rights. That way you can pitch the game to foreign publishers even while it’s selling on the shelves of your local store. Ask the publisher what their plans are with worldwide rights. If they don’t know or won’t commit then try to retain those rights. If they do retain foreign rights then there should be a separate rate. What happens is that a foreign publisher will express interest in publishing the game in a different country (and often a different language). They will make a deal with the publisher if you’ve given them foreign rights. Your original publisher might get 10% of the game’s sales (distributor cost again – not retail price!) which means if you don’t negotiate correctly then you could end up getting 7% of that 10% – which is peanuts. It’s not uncommon to state that if a foreign publisher publishes the game then as the designer you get 25-50% of what your original publisher gets. Of course if you retain foreign rights then you get 100% – but it means you have to do more of the legwork and put your salesperson hat back on. Digital rights: More and more games are turning into apps and online versions. Has your publisher published anything digitally yet? Do they know that aspect of the business? If they do, then it’s still wise to ask what their plans would entail if the board game were deemed to be successful. If they aren’t experienced in that realm, then it’s possible that you should ask to retain those rights. It might be tougher nowadays to retain these rights as app-based gaming can be quite profitable and publishers are wary to waive those rights, even if they are inexperienced in that field. As with any contract, be careful to read it in full and get clarification on anything that you don’t understand. If you need to get a lawyer to look it over, that may be a good idea – just remember that not all lawyers know all the ins and outs of intellectual property law. And neither do we, so take all of our advice with a grain of salt! 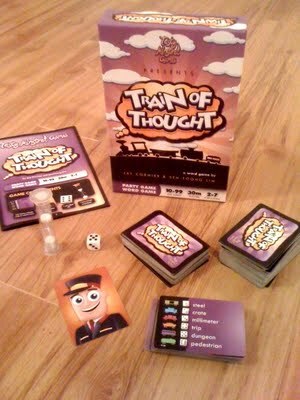 One other thing that exists in the boardgame world is the right to have first crack at making an expansion to a game. You should strongly consider having a clause written to protect you from being cut out of the loop on your own game should it be a hit and the fans are clamoring for more. It only makes sense from a designer’s point of view, but just because it’s common sense doesn’t mean it will be in your contract and you want to ensure that the publisher is contractually obligated to seek your design services first should they ever want to publish an expansion or supplemental goods for the game. 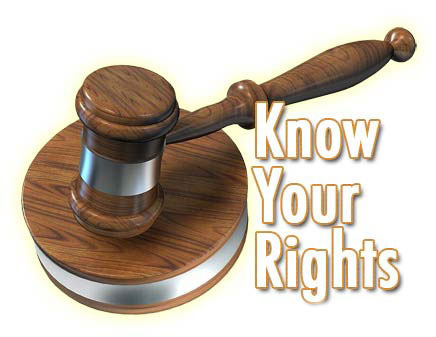 You can also have your rights return to you at different times for different reasons. For example, a designer we know has a contract that gives his publishers rights to the intellectual property in Europe for a set period of time. During that time, they have exclusive rights to publish his game in Europe. They also have the rights to publish or co-publish outside of Europe, but each area is treated separately and each has it’s own timeline. So, it may be that the rights for Europe and North America are set at 5 years but Asia and Africa have to be acted upon within 1 year of signing the contract. Once that year is up, if the publisher hasn’t found a co-publisher in Asia, then the rights to the game return to the designer, but only for Asia and Africa and he is free to seek out publishing opportunities in those areas of the world. For some game publishers, there is likely no way you will get your name on the cover. Most small boutique companies want to entice gamers with the notoriety and reputation of the game’s designer as their brand may not be big enough to garner attention yet. Others, like Hasbro or Mattel, won’t allow the designer to have their name grace the cover. This should be something you put into your contract if it is important to you. Most of the rest of the issues can be negotiated outside of a contract (e.g. can you put the names of your playtesters in the rules, etc.) but the majority of the most important rights to consider are above. If you can think of any more, let us know! Another positive review for Belfort! Great review Aaron – thanks! Check it out here. Here are some things to consider when you’re negotiating a contract with a publisher. This post will focus on the money side of the contract. Advance: Some bigger publishers might give you advance at the time of signing. 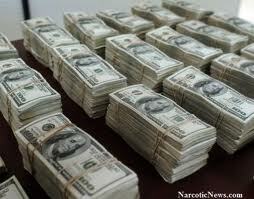 This could be a few hundred dollars or a few thousand dollars. If it’s an advance this means that it comes out of your royalties until it’s been fully recouped. So if you get a $2000 advance then you will forego the first $2000 of your royalties. Sometimes it might not be an advance but an actual signing bonus which doesn’t come out of your royalties. Obviously you should be clear in the contract which it is before you sign! One of the reasons why a publisher would give you an advance is because it motivates you to help in the marketing of your game since you won’t make any more money until the advance has been paid off. Percentage: This is what you will get paid for each game that is sold. Most publishers will pay you a percentage based on their selling price – not retail price! If the game retails for $25 then the retailer probably buys it from the distributor for $13 or so and the distributor probably buys it from the publisher for about $7. So your percentage is based on that $7 not the $25. What kind of percentage is fair? There are many variables here. If it’s with a big company that plans a big print run and will support it with advertising then your percentage could be small, like 3-5%. If it’s a tie-in to a big franchise like Harry Potter or Spiderman then it could be even less. If it’s a smaller publisher with a smaller print run then you could get anywhere from 7-15%. If it’s your first game published then expect it to be on the lower side since they are taking the risk with an unknown designer. There’s more than just a flat percentage to negotiate though. You could negotiate a rate that increases over time. You could suggest that on the first 1000 games you’ll take a 7% rate, then the next 2000 games it goes up to 8%, and so on until a cap is reached. Publishers like this idea because if the game is a flop then they’ve paid out less to the designer, and designers like this because if the game is a hit then they take some short term pains to get some longer term gains. We tried this with one of our games and the publisher liked the idea. We recommended the sliding scale that we thought was fair (OK, we’re not dumb – negotiating tactic #1 – always ask for more than you would settle for! ), and the publisher came back with a revised scale that worked for us. Copies of the game: This is the easiest thing to negotiate. It’s a lot easier to ask for more copies of the game than a higher percentage. But there’s more to this than just how many copies you get when it’s published. You should have a clause in the contract that states that you can buy the game directly from the publisher at any time at distributor cost. The publisher still makes a profit, but you get to buy the game at $7 instead of buying it at a store for $25. Even though you’ll be getting your own copies, they run out fast and if you’re planning on doing a bit of your own marketing (which you definitely should and a future post will be dedicated to it), then you’re going to want access to more copies of your game for cheap. 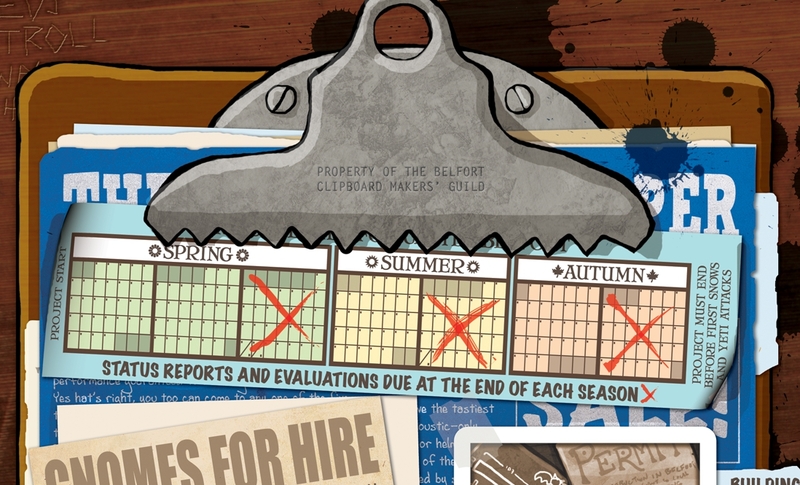 Also you’ll want to put in your contract that you’d like at least 1 new copy from each successive print run. As the game gets reprinted, sometimes there are art or rule revisions and you’ll be thankful to have the most up to date copy in your collection. If you agree upon an advance, be careful to read the wording in the clause – do you have to pay back the difference if the game does not make that much in royalties, ever? Do you have to pay it back if the company does not go to market with the game or if the company folds prior to the game being released? It pays (literally) to be sure of these things up front! For a well-established publisher, an advance against royalties should not be a major issue at a low dollar amount (depending on various things such as estimated print run and percentages). But for a start up company, paying out anything up front, even though it may be “worked off” over time, may make or break the deal. If, like Jay says, you can convince them that the advance is an investment in you being an active marketer, that may swing things in your favour. In my mind, the advance is what lets Jay and I work on new games while the other ones are being developed and produced. 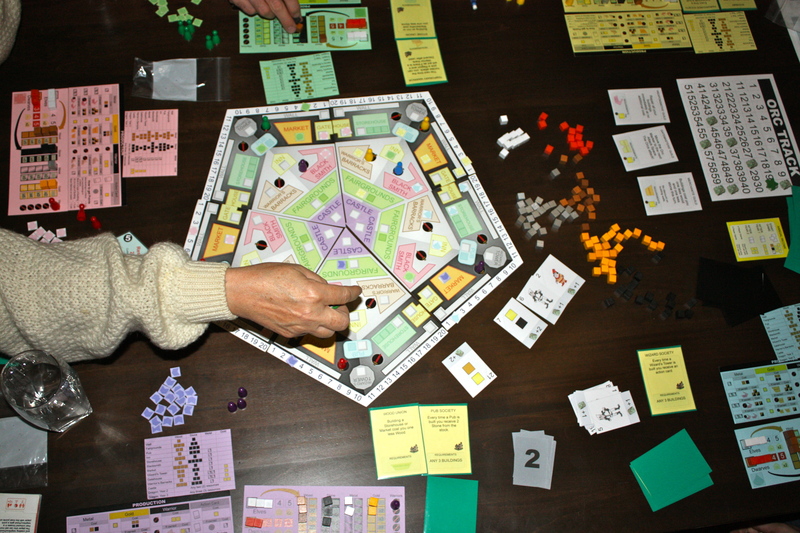 An advance gives designers recognition up front and some breathing room while they’re waiting for the game to be completed. It’s standard fare in other creative fields such as music and literature, so why not game design? Signing bonuses are really only for the true “superstars” of our field so don’t expect to see those on your first time around! Regarding percentages, it is a good idea to not get too caught up in the percentage itself, but to consider the print run of the game and the market penetration of the publisher. Do the math. A small print run by a boutique publisher of 1000 games at 15% a game nets you $450.00 if the publisher’s selling price is $3.00 and it sells out COMPLETELY. Compare that to 3% royalties on a Hasbro-level print run of 50,000 copies with a publisher’s selling price of $2.00. That game could see sales of only 10,000 copies (1/5 of the print run) and you’d be making $600. So you’re not a millionaire yet, but, in short, increased increased revenue potential exists with higher print runs, despite lower percentages and lower selling prices. While percentages are important, you may want to take a look at other things like the company’s marketing plan, their mass market distribution (e.g. local hobby stores vs. Toys R Us and Target) and what their normal print run and sales are like on similar games. Knowing that you’re with a successful company may help you be more at peace with a seemingly low percentage royalty fee. As you get more games out there and build a strong reputation as a successful designer, you will be able to command higher royalty fees. And as you get more savvy with this end of the process, you’ll get to know who you can negotiate with and what the “Industry Standards” are. One thing that Jay and I are considering doing when it comes to copies of our games is purchasing a whack up front and selling them online. The reason why is because we’re Canadians and our fans, friends, and family who are Canadian get royally shafted when it comes to ordering single units from the US. Also, we usually know a lot more about the US distribution sooner while our fellow Canucks are chomping at the bit for the games. So, we’d love to be able to meet their needs sooner than later. So this is another reason for us wanting to put a clause in the contract allowing us to purchase at cost. We may never do it, but we’d like the option to be there in writing should we want to.